How Fast Are Cable Modems and Internet Connections? How Fast Is Cable Modem Internet? In the early days of the internet, cable internet providers supported broadband network speeds as low as 512 Kbps (0.5 Mbps) for downloads. These speeds have increased over the years by a factor of 100 with improvements in internet network technology. Cable remains one of the most popular types of high-speed internet access in the U.S., Canada, and other countries. Rated connection speeds of cable internet connections typically range between 20 Mbps and 100 Mbps (with actual data rates highly variable, depending on the provider and network conditions). Cable modem technology follows the industry standard Data Over Cable Service Interface Specification (DOCSIS). Older DOCSIS 2.0 cable modems supported download speeds up to about 38 Mbps and uploads up to about 27 Mbps. These modems worked well in the days when cable internet providers offered service plans with 10-15 Mbps or lower data rates. As cable technology has improved, the need for faster cable modems led to the introduction of DOCSIS 3.0, which significantly increases a modem's performance compared to older DOCSIS versions. DOCSIS 3.0 (and newer 3.x) cable modems can support connection speeds over 150 Mbps. Many cable Internet providers now sell plans for service that runs faster than 38 Mbps (typically, 50 Mbps for downloads). Larger providers sell or rent DOCSIS 3.0 modems to ensure their customers achieve the desired performance levels on their home networks. Consumers can also buy their own modems if they prefer. Did you know your cable speed will vary depending on the usage pattern of your neighbors? A single cable line connects to many households, and the total available network bandwidth then gets shared among subscribers in that locality. If several of your neighbors access the internet simultaneously, it is a distinct possibility that cable speeds for you (and them) will decrease significantly during those times. Service glitch: Cable speed can suddenly drop if the service provider has technical difficulty with their network. Speeds should return to normal after a few minutes or hours (depending on the severity of the service issue). Bandwidth cap: Providers can throttle the performance of an individual subscriber's internet connection based on their terms of service. A customer who exceeds their monthly allowance of bandwidth, for example, may have their maximum download speed restricted to a much lower value than normal. Misconfigured or malfunctioning router: Home routers sit between your home computers and the internet connection. If overloaded, overheating, or defective, a router can greatly limit the speed at which devices can stream or download data over the internet. Slow connection to the router: Thanks to dynamic rate scaling, some Wi-Fi connections are designed to operate below 10 Mbps under certain conditions. No matter how fast the cable modem and its internet pipe, the speed of the internet for that device will be limited by the slow Wi-Fi link. Issues with devices: Very old computers lacking sufficient processing power or memory cannot keep pace with a high-speed internet connection. Devices may also have apps running in the background that are consuming these resources. 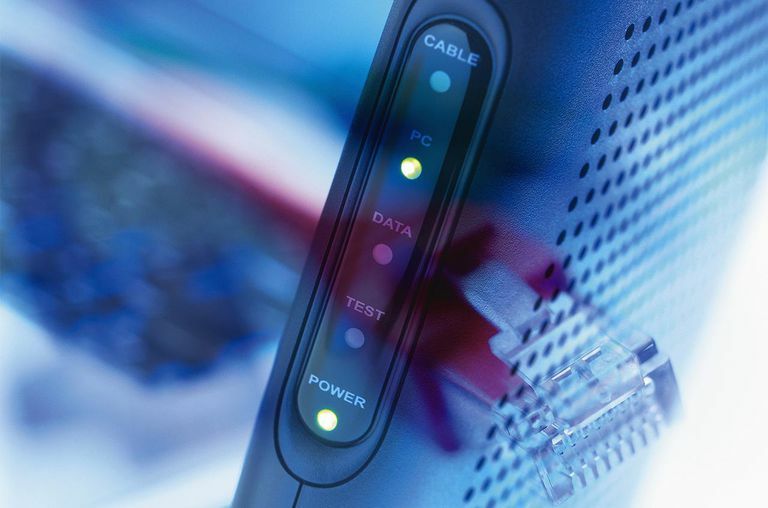 If your cable internet isn't performing as you expect, the service provider's connection may or may not be the cause and you can try doing some basic troubleshooting before contacting your service provider. How Fast Is a Cell Phone Modem for Wireless Internet? Which Is a Faster Internet Connection: DSL or Cable?